Please select one of the links below to view the information related to that topic or question. What documents are listed in the "Recent Additions" area of the site? Why must I wait to download the articles on the "Coming Soon" page? How can I suggest another facet to be added to the site? What is the small "i" icon located within the site? How can I remove a selected facet to broaden my search results? After narrowing results with both a Volume and Issue facet, how can I quickly view all of the orginially available Volumes for that Collection? How often is the Home page updated? To search the entire CDC Stacks site, select "All Collections" from the drop-down list and enter a keyword or phrase. Then click the Search button. To search within a specific collection, select a collection from the drop-down list and enter a keyword or phrase. Then click the Search button. Note: If you are searching for a single word, using quotation marks does not affect the search results. However, if you are searching for a phrase containing more than one word, quotation marks play a role. For example, entering "bicycles and pedestrians" (with quotation marks) will return fewer results than entering bicycles and pedestrians (without quotation marks). For more information see item 3 below, regarding what you want to search for. The Advanced Search in CDC Stacks provides robust searching capabilities within the repository site. The default is to search across all of CDC Stacks ("All Collections"). To specify a single collection, select an item from the Collections drop-down list. 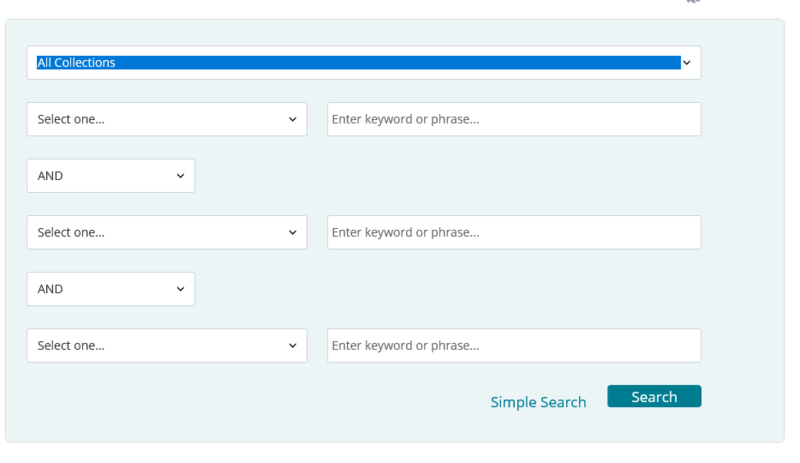 You can select up to three search categories and corresponding keywords using the fields above or you can select only one field and click the Search button. Input what you want to search for. Note: If you enter two words separated by a space, one combined result set is returned. This input acts like first word OR second word. For example, keying public transit returns a list of documents that contain the word public combined with a list of the documents that contain the word transit. However, to obtain a more precise match from your search, phrases must be enclosed in quotation marks. Keying"public transit" (with quotation marks) returns the list of documents that contain the entire phrase public transit. 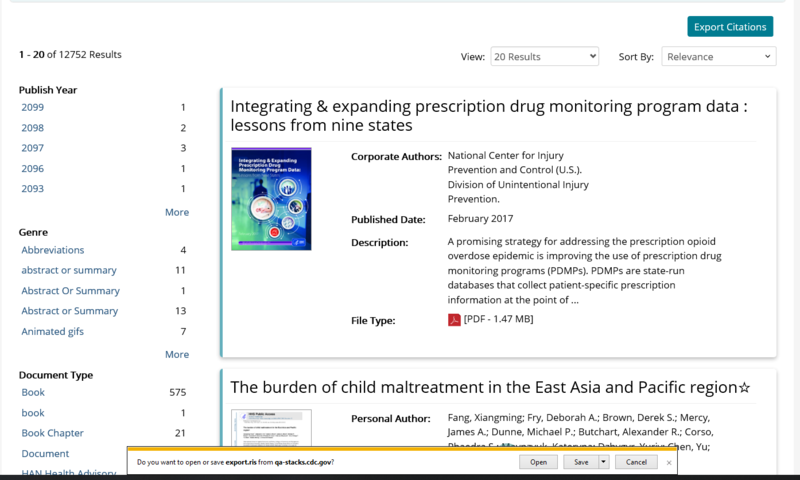 You can now search on documents by the type of works they were published as; a book, journal article, newsletter, poster, report,etc. Select "Document Type" in the category drop-down, pick a specific document type in the drop-down that appears to the right, then click the "Search" button. 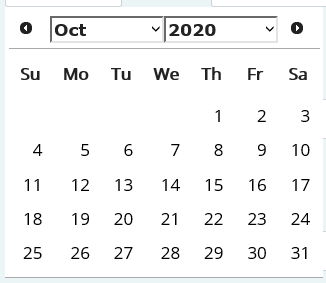 You can type the date directly within the fields or you can utilize the date picker by clicking the calendar icon to the right of each field. 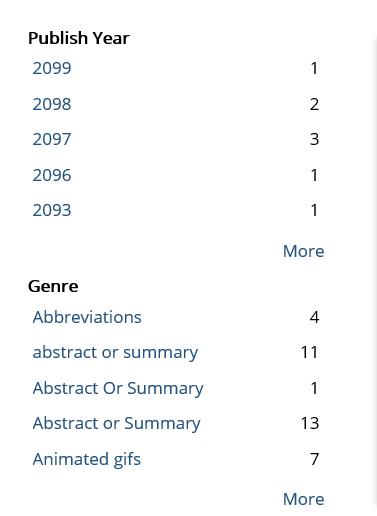 After entering the published date or date range, click the "Search" button. CDC Stacks has documents in several different languages. To search for documents written in a specific language select "Language" in the category drop-down, pick a specific language in the drop-down that appears to the right, and then click the "Search" button. To add additional search criteria, select the appropriate Boolean operator from the drop-down menu. The following table describes the Boolean operators. Narrows your search and retrieve records containing all of the words it separates. The search retrieves documents that use both search terms you entered. Broadens your search and retrieve records containing any of the words it separates. This search includes results that contain either of the search terms you entered. Narrows your search by excluding Articles that do not contain the term following it. The search first gets a result completing (A AND/OR/NOT B). Next, it completes AND/OR/NOT C on the returned result. Lastly, the search results are displayed. Note: By clicking on the "x" icon in any Search text box, you can clear that field. Or you can click the "Clear All" link to clear all the text boxes. OAI-PMH specification is defined as a RESTful service, where each request requires certain attributes. A "verb" is described as to what is being asked. each verb can have different attributes. A full description of the specifications can be found here. Retrieve the metadata formats available from a repository. For Stacks, only oai_dc is currently available. - identifier (optional). if retrieving information about a specific format. - metadataPrefix (required): specifies the metadataPrefix of the format that should be included in the metadata part of the returned record . Stacks supports oai_dc only. This verb retrieves only headers rather than records. Useful if looking only for the metadata. - metadataPrefix (required): specifies the metadataPrefix of the format that should be included in the metadata part of the returned records. Stacks supports oai_dc only. - from (optional): timestap for upperbound value of records to retrieve. - until (optional): timestamp for lowerbound value of records to retrieve. Similar to ListIdentifiers, but this method retrieves all records and not only headers. Note: the resumptionToken parameter is mutually exclusive with other parameters. It is used to paginate through results and the token is given by each request under the tag <resumptionToken> at the end of the response. The first request will pass the appropriate values for other parameters, including metadataPrefix, from and util. subsequent pages have to pass only resumptionToken. https://<host>/fedora/export/download: Retrieve meta data from the repository as a file to be downloaded. The data will be in the format of JSON. If "rows" not specified and it is download, then all applicable data will be retrieved. Therefore, it is strongly recommended that the date range or a collection is passed to the request. If "rows" not specified and it is view, then by default only 100 rows of data will be returned each time, to view more, pass to the request the resumptionToken from the result. Users of Stacks can generate bibliographic citations from one or more documents. Click on the title to a document. Click on the Export Citations button. Option will be displayed to Open, Save or Cancel the exported citation. To view the citation data in a citation reader like EndNote, save the file and open it from the reader. From the search results page in Stacks, click on the Select Docs for Citation Export button. Select all documents from the search results list by clicking the Select all docs (Max 200) link. An option is displayed to Open, Save or Cancel the selected citations. A link, Select all docs (Max 200), is displayed under the button and checkboxes are displayed next to every document listed in the search results. 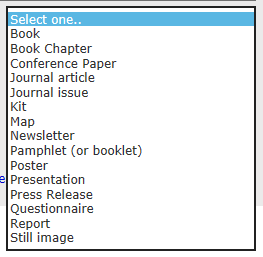 Click on the checkboxes of one or more of the documents on the page. The Select Docs for Citation Export button color is changed to orange. Click the Select Docs for Citation Export button. A Collection includes documents that address a shared topic. Searching within a collection allows you to narrow your search results. 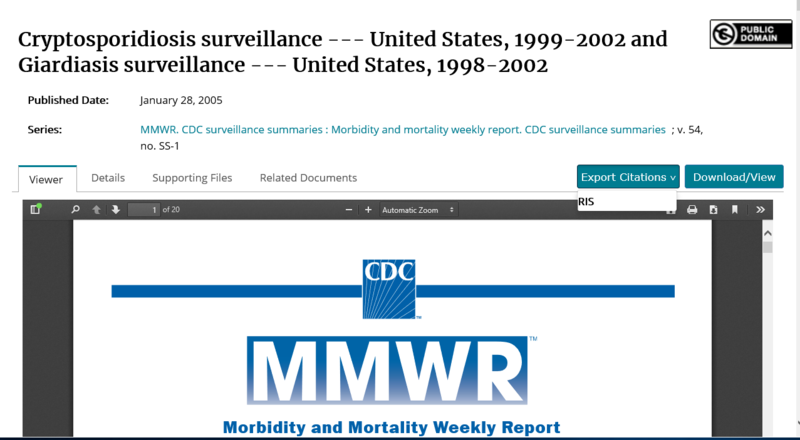 The documents that are listed in this area of CDC Stacks site are the twenty documents that were most recently updated or added to the site. These documents are sorted by most recently updated or added to least by default and they may or may not be the most recently published documents. 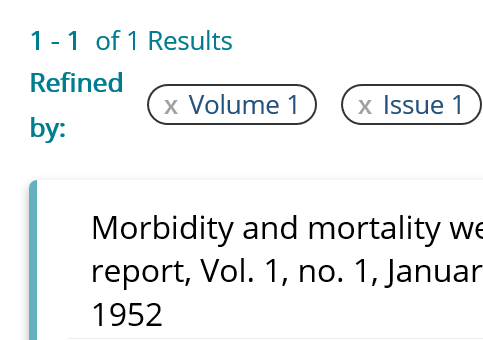 These journal articles have been placed under a Public Access Embargo. This is the period of a maximum of 12 months in which access to academic journals is not allowed to users who have not paid for access (or have access through their institution). 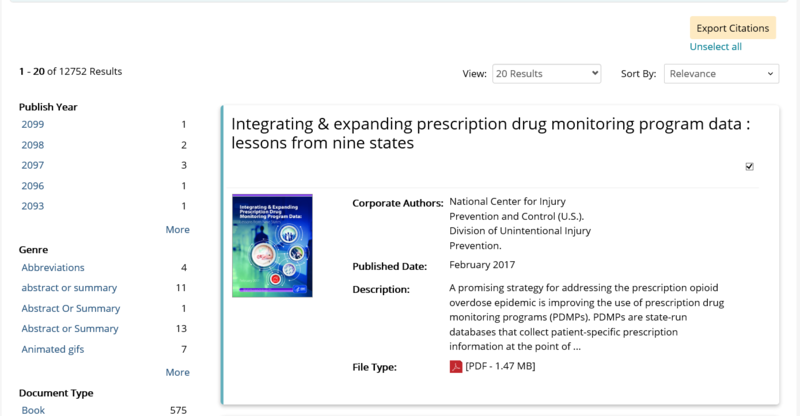 The CDC Public Access to Publications Policy was developed to ensure that these journal articles may be made freely available to the public within 12 months of publication. Read more about the CDC Public Access to Publications Policy. 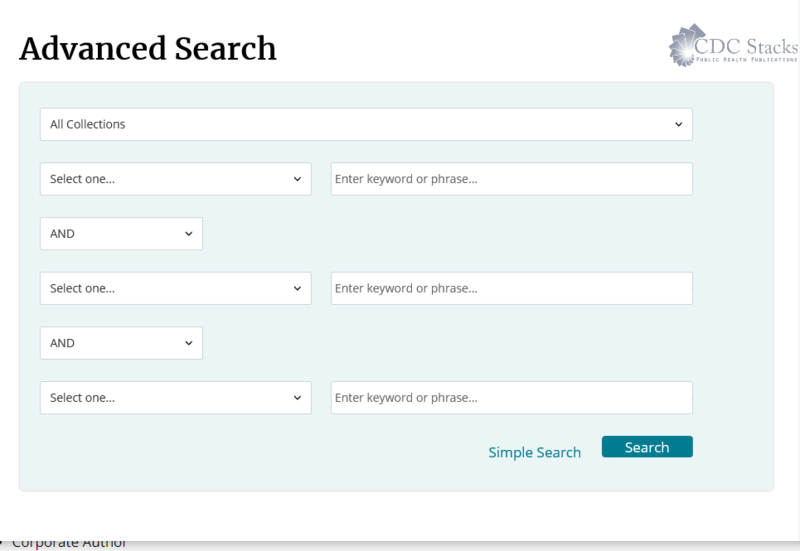 A facet allows you to narrow your Search based on pre-defined topic categories. You can email us at publishinghd@cdc.gov. The small "i" icon is a tooltip. When you hover your cursor over the icon, additional information is displayed to help explain that section of the site. There are multiple ways to deselect a facet; Click the "x" to the left of the facet in the "Narrowed by" section above your results or deselect it within the "Narrow Results" box to the left of your results. After narrowing results with both a Volume and Issue facet, how can I quickly view all of the originally available Volumes for that Collection? Simply click the "x" next to the selected Volume and this action will also remove the selected Issue as well. 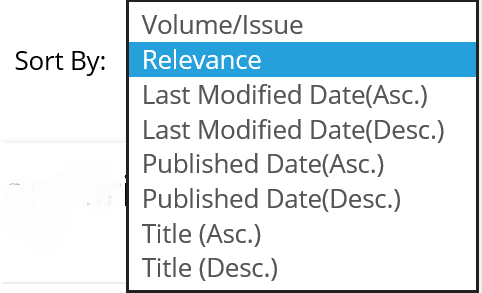 Search results within a collection can be sorted by Relevance, Last Modified Date, Title, and Published Date. The content for Recently Added and Popular Articles modules are updated every week. The Featured Article and In the Spotlight are updated every other month. The Featured Collection is updated whenever a new Collection has been added to the CDC Stacks repository. To view a list of previous Spotlights, click the "Spotlight Archive" link at the bottom of the module.